The Young Folks has covered many anniversaries in 2015. From films like Jaws (1975) and Dog Day Afternoon (1975), to albums like Bob Dylan’s Blood on the Tracks (1975) and Radiohead’s The Bends (1995), this was a year in which many great works of art turned 20, 40, even 50, but there’s one anniversary that hasn’t been talked about much. 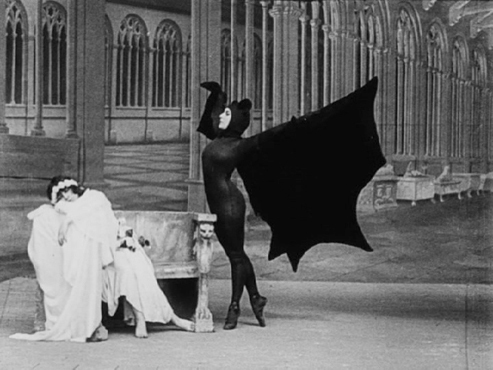 In 1915, 100 years ago, Louis Feuillade invented the thriller genre with his brilliant serial Les Vampires (1915-16). That’s a bit of an exaggeration, of course. Thrillers had existed long before 1915, in literature, theater and even films like The Great Train Robbery (1903) and the original adaptation of Frankenstein (1910) can be viewed as early incarnations of the genre. It’s arguable that Feuillade even made an earlier film that could count as a thriller, Fantômas (1913-14). However, in terms of early influence (as well as effectiveness), there is no contest. Les Vampires follows Philipe Guérande (Édouard Mathé), a reporter investigating the Vampires, an underground gang of thieves and murderers that always seem to be one step ahead of him. Alongside him is his friend Mazamette (Marcel Lévesque), a former member of the Vampires who switches sides. In silent films, style is often substance, and that’s certainly the case with Les Vampires. The mise-en-scène, facial expressions and props—including, among other things, a poisonous pen—tell a fascinating story by themselves. This makes it all the more exciting that the story is so effective. While Fantômas was based on a newspaper series and followed its plot closely, Les Vampires was mostly improvised, with Feuillade writing minimalist scripts and figuring out the details during filming. Despite this, Les Vampires is much more tightly plotted than his earlier serial. There are no plot points as ridiculous as when the hero in Fantômas is suspected of being the titular antagonist and imprisoned for reasons that are never explained. And while Fantômas began with its best episode (the subtle, moody In the Shadow of the Guillotine) and never reached that height again, Les Vampires keeps topping itself, introducing new plot points in each episode, none of which feel wrong tonally or distracting logically. But as I said, style is substance, and Les Vampires is plenty stylistic. When people want to trace the thriller genre back, they often end at early films from Alfred Hitchcock and Fritz Lang. The techniques that these filmmakers used are clearly on display in Les Vampires. Its car and train chases look similar to the ones Hitchcock used in his chase pictures like The 39 Steps (1935), while the gothic imagery brings to mind Lang’s masterpiece M (1931). Furthermore, Les Vampires also shows the births of several different tropes that would come to define the thriller genre. Over the course of the serial’s ten episodes and nearly seven hours, double-crosses, sleuthing, revenge and (most notably) the femme fatale all play important roles in the plot. The femme fatale in Les Vampires is the Vampires’ main henchwoman Irma Vep, played masterfully by Musidora (who became a star in France because of her role). Irma Vep—whose name is an anagram for “vampire,” years before Alucard, Nilbog and Tom Riddle—carries the film in a way the other characters can’t. The protagonists in Les Vampires are, for the most part, dull. Guérande is a blank slate hero, especially compared to Fantômas’ far more developed protagonist Inspecteur Juve. Mazamette has a compelling story arc early on, before descending into mere comic relief. Even the Vampires’ leaders are disposable, being replaced several times, each time by a less notable character. But as soon as Irma Vep is introduced in episode 3 (The Red Codebook), Les Vampires instantly becomes her film. Her introduction may be the most infamous part of the series, a nightclub performance that itself created a trope, bringing to mind everything from Gilda (1946) to Blue Velvet (1986). Irma Vep is easily the most developed character in Les Vampires, but considering that the script was written as they went along, it’s likely that the development came about because of Musidora’s performance. As soon as she appears, she lures you in with her dark eyes and expressive face, and you immediately want to know more about this woman. Eventually in the story, she’s hypnotized by the leader of a rival gang into being his mistress, as well as murdering the Vampires’ leader, and you want to see her escape his control. At another point, she’s assumed dead and, despite its predictability, there’s a certain excitement when she turns up alive. This is a character you care about, and you may even want to see her redeemed, despite her wrongdoings. That’s a power only great villains have, when the audience is able to stop seeing them as antagonists and instead just see them as human beings. But while Musidora and the complex character she created is a major appeal, Les Vampires also succeeds because it’s just plain fun. There’s an excitement to the action, the suspense, the gothic look and the performances that makes it far more gripping than you’d expect a 100-year-old, seven-hour film to be. It was so ahead of its time, in fact, that I imagine it’s no less watchable now than when it first premiered, if not even more so. Watching a film for its significance to film history can seem like a chore, and the length, age and silent presentation of Les Vampires may be off-putting to many. Luckily, the fact that it’s split into 10 episodes makes it easy to bow out if you decide it’s not for your taste. The first episode (my least favorite) is only 33 minutes long, while the much better follow-up is 15 minutes. You will likely be hooked by the time you meet Irma Vep in episode three.